Rube Goldberg could have used the Showy Orchis pollination system as an inspiration for one of his elaborate contraptions. 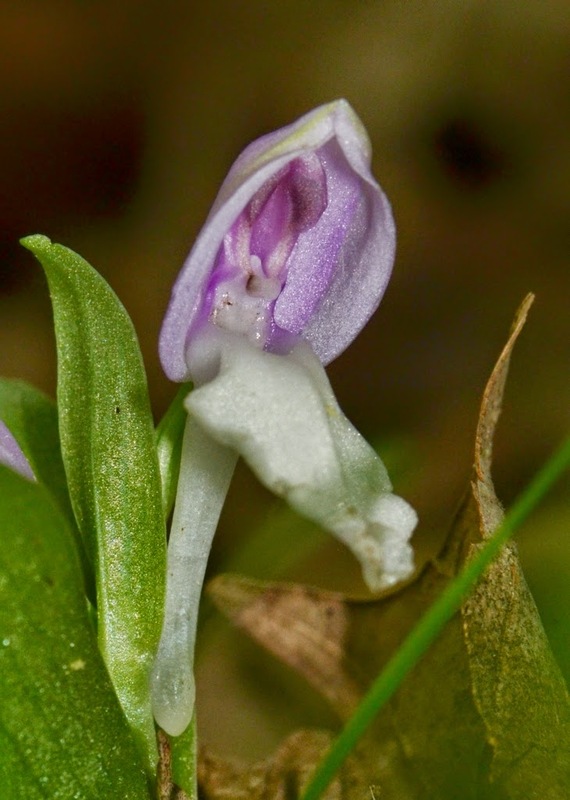 The Showy Orchis uses a complex combination of some commonplace components to effect cross-pollination. 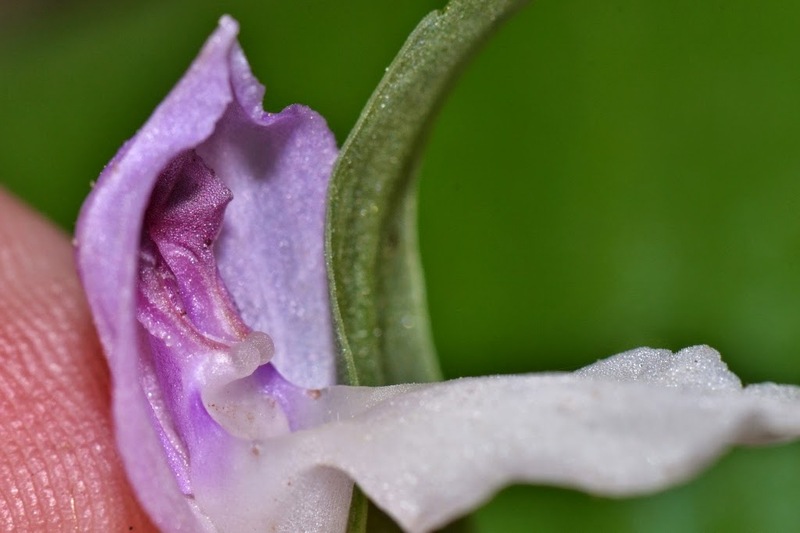 One of the system's components is an intentionally sticky situation - on the part of the orchid. As a result of this orchid's pollination process, its bumblebee visitors temporarily gain an extra pair of antennae. 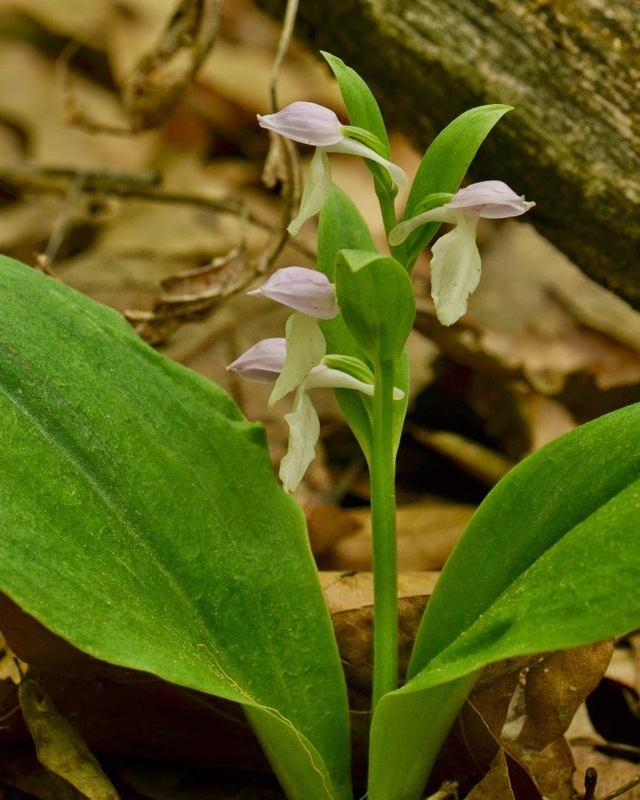 It follows that a naturalist thinks about this remarkable pollination method every time he sees a Showy Orchis. 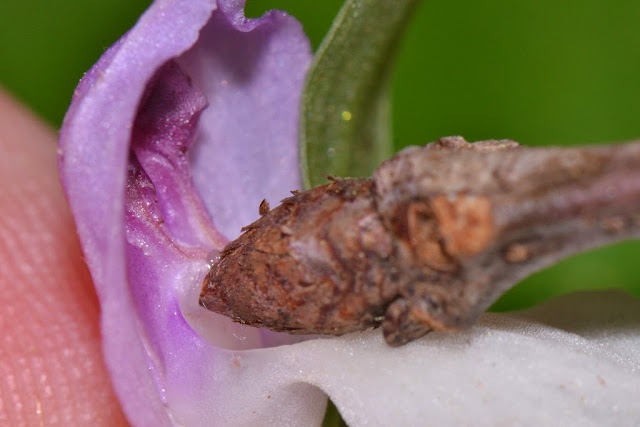 When a bumblebee visits a Showy Orchis for some nectar, it gets more than it bargained for... it leaves with an extra pair of antennae glued to its head. 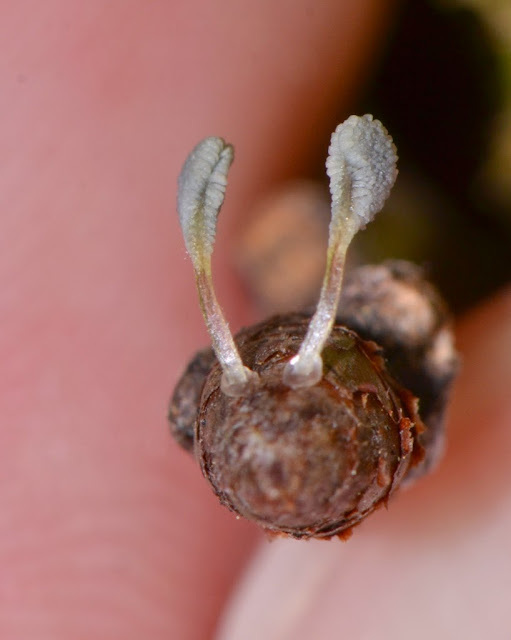 Here is a photo of the orchid's pollinia stuck to a twig - which I used in place of a bee for demonstrative purposes. How does a bumblebee get tricked into getting these pollinia glued to its head? 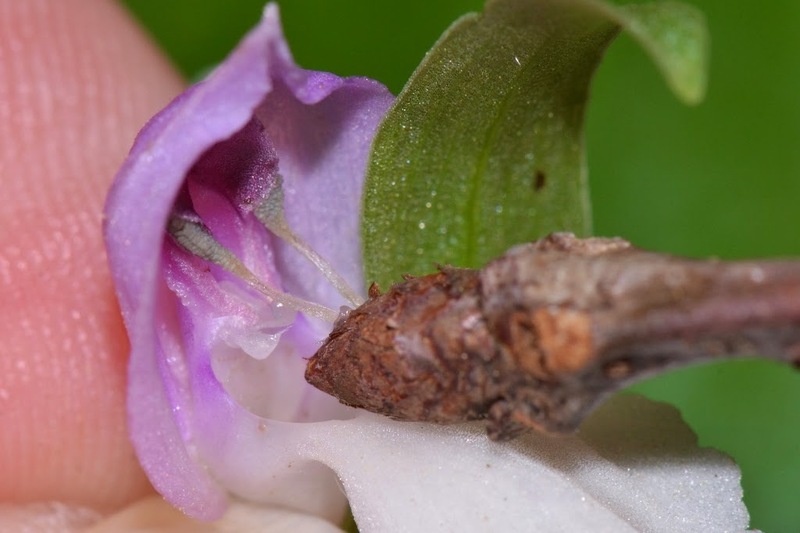 Well, let's take a close look at this orchid's pollination mechanism. Of course, the whole flower has a part to play in this masterfully designed system - one designed to help ensure cross-pollination. The large white lip serves as a landing pad for the bees. 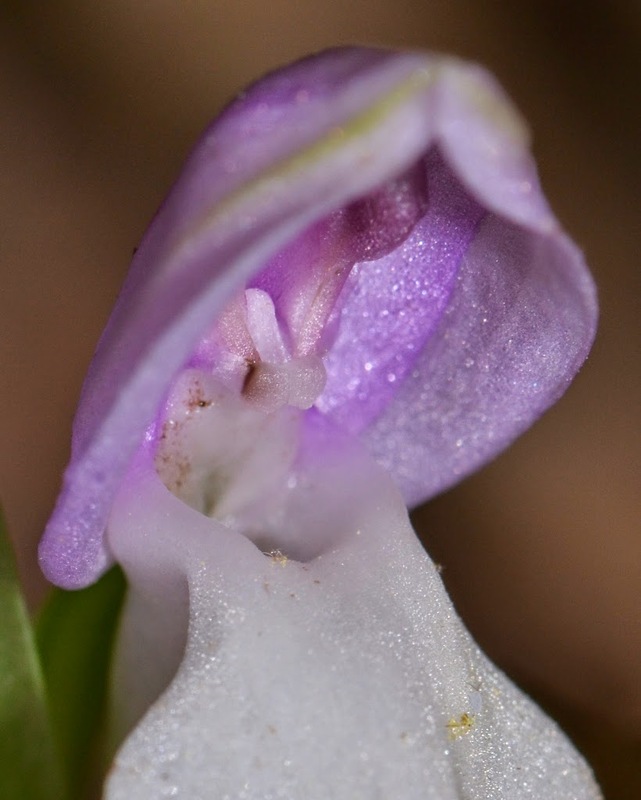 The long white spur is where the nectar collects to attract the long-tongued bees that visit the orchid. 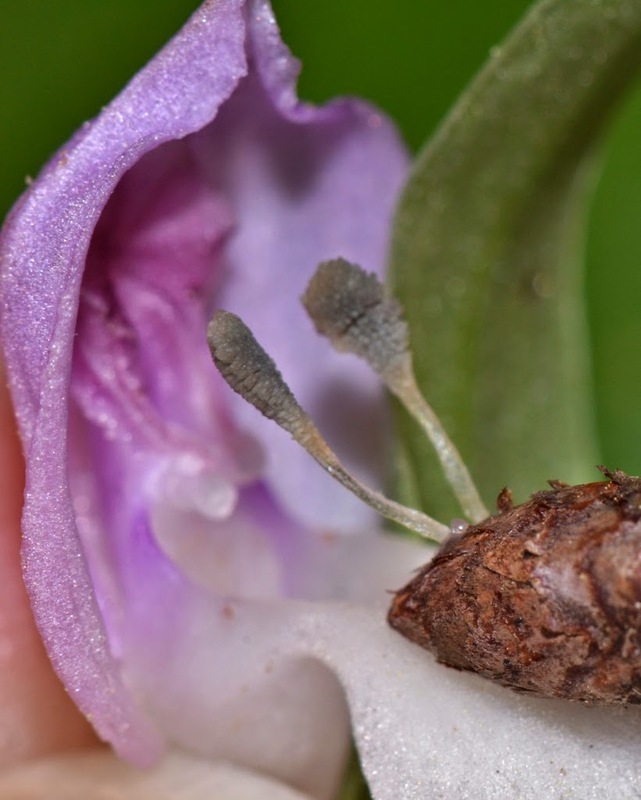 The little orchid's lavender hood protects the pollination mechanism. 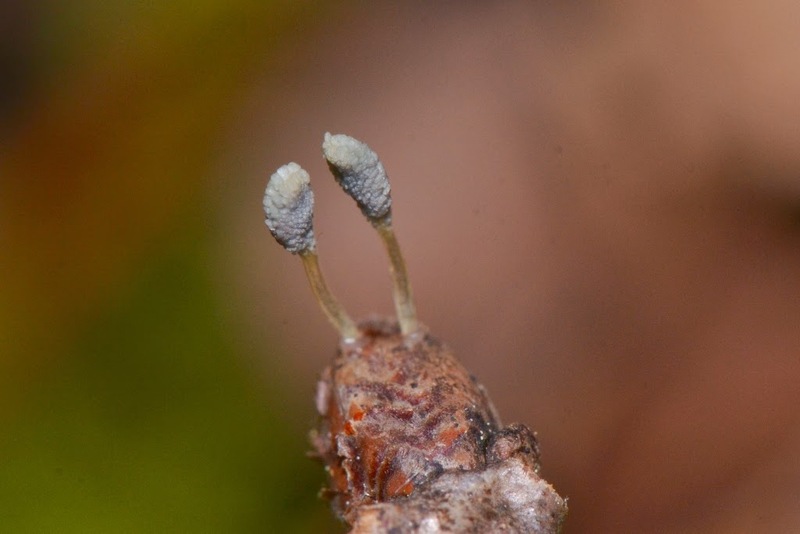 The vital pollen are clumped together in twin masses and are hidden under membranes near the top of the hood. Twin glue-dots are strategically placed to contact the unsuspecting bumblebee's head. Incidentally, the orchid flower looks harmless enough doesn't it? If you were a long-tongued bee and were interested in gathering nectar, wouldn't you land on that inviting white landing pad and extend your tongue into the orchid's well? Notice the twin balls convieniently placed at the head of this nectar well (the spur) where the bees will be sure to touch with their head? Therein lies the "trigger" - a very key part of this pollination system ... those innocent-looking balls are the lumps of sticky glue that will adhere to a visiting bumblebee's head. Take a look at this series of photos of the orchid pollination mechanism in action (keep in mind for demonstrative purposes I used a twig in place of a bee). 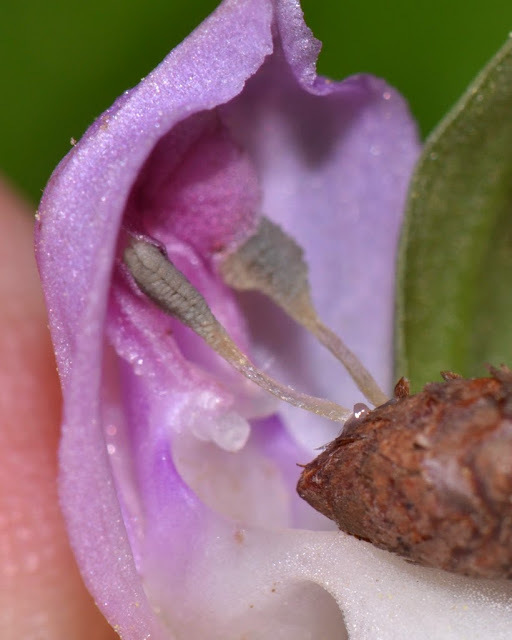 This first orchid photo shows the lip (or landing strip) extending to the right and the lavender hood or helmet partially covering the key components of the pollination mechanism. Can you picture a bumblebee sitting on the orchid's lip and reaching deep into the orchid's spur for some nectar? Perhaps a twig will make a good imaginary bee. Remember those innocent-looking twin balls? Now they have contacted our bee's "head" and their protective covering has released some sticky glue... see the shiny, sticky substance where the twig contacted the balls? The term for the sticky stuff is "viscidia", and the protective covering is called "bursicles". As our "bee" retreats, the sticky viscidia have adhered to its "head" and as a result the pollinia are being removed from their protective membranes. Here is another photo of the pollinia as they are pulled from their protective bursicles. 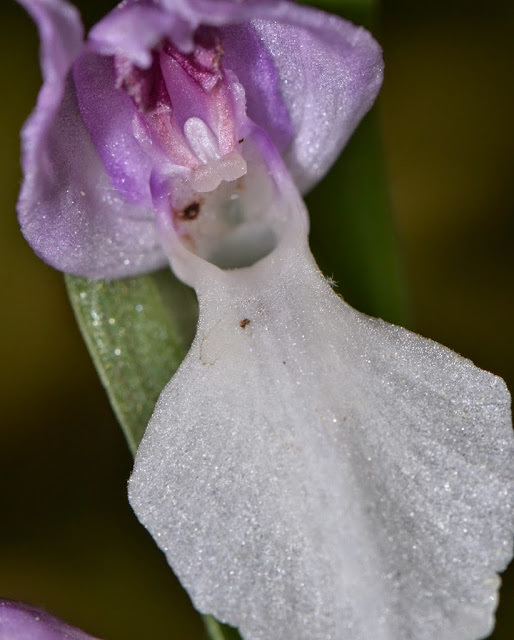 Here is a close-up photo of the Showy Orchis hood as the pollinia are further removed from their protective coverings. 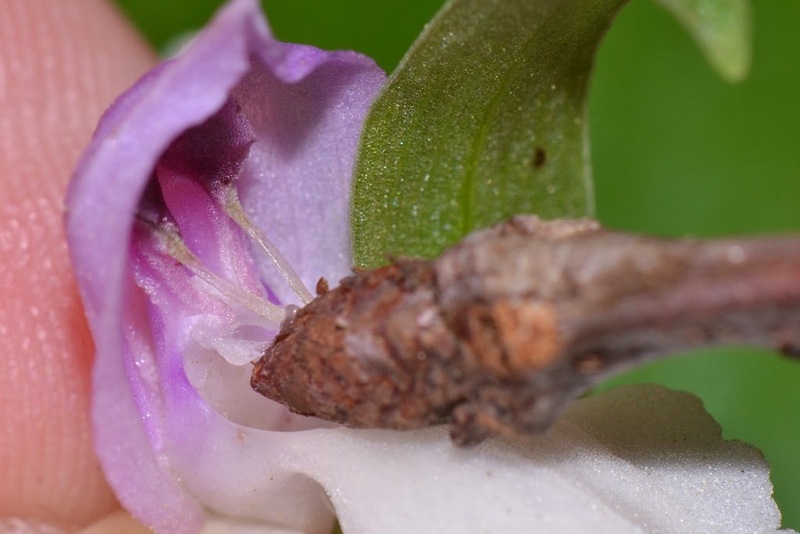 In this next photo the freshly removed pollinia of the Showy Orchis are nicely displayed - similar to how they would be attached to a real bumblebee. Now, picture this bumblebee flying to the next orchid with its extra pair of antennae. It's like a cartoon... see what I mean about this orchid's pollination system reminding me a Rube Goldberg machine? 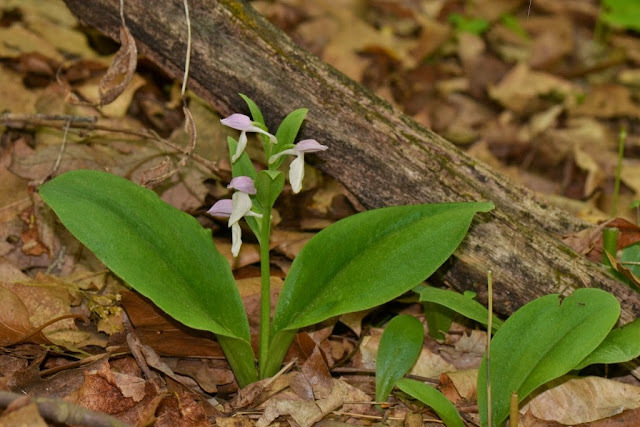 The orchid's pollination is an elaborate, complex system of interacting parts that effect a commonplace result - the cross-pollination of some small, inconspicuous orchids on the forest floor. Have no fear, I had our fake bumblebee, with pollinia attached, visit another orchid up the creek. I hope I affected some cross-pollination like a real bumblebee would have done had it visited this particular Showy Orchis. We hope a few bumblebees do likewise. See some more photos of the Showy Orchis in my previous post. Fascinating Dana. Those macro photos are wonderful.